The Perilous Sea - Sherry Thomas. And of course, I have to give a shout-out to the long-awaited third book in The Kingkiller Chronicle by Patrick Rothfuss. Doors of Stone is listed on Goodreads... but there isn't even any cover art as a placeholder yet. Rothfuss, get going on that! I'm sure it will be beautiful when it is done. In the meantime, luckily, most of these sequels are already out, so I have plenty to occupy me until it's released. 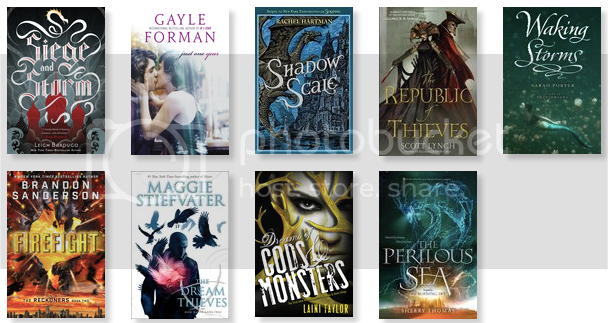 Really looking forward to Shadow Scale as well, and I'm hoping to read The Perilous Sea and finish Laini Taylor's trilogy as well. The Grisha trilogy and The Raven Cycle are great books. I know, I really have next month's reading cut out for me! I loved the Grisha trilogy! I've got to take a peek at the first one again, just to refresh myself, before I jump into reading the sequel.